Hysterisis is a system property that is fundamental to a range of engineering applications as the components of systems with hysterisis are able to react differently to different forces applied to them. Control theory is used to model these complex systems and cause them to behave in the desired manner; the Bouc-Wen model is a well-known semi-physical model that is used extensively to describe the hysterisis of systems in the areas of smart structures and civil engineering. The Bouc-Wen model for system hysterisis has increased in popularity due to its capability of capturing in an analytical form a range of shapes of hysteretic cycles that match the behaviour of a wide class of hysteretic systems. “Systems with Hysterisis: Analysis, Identification and Control using the Bouc-Wen Model” deals with the analysis, identification and control of these systems, and offers a comprehensive and self-contained framework for the study of the Bouc-Wen model. Provides a rigorous mathematical treatment of the subject along with practical comments, numerical solutions and a case study of magentorheological (MR) dampers. Begins by analysing the compatibility of the Bouc-Wen model with the laws of physics, and continues to cover the relationship between the model parameters and hysterisis loop, identification of the model parameters and control of systems that include a hysteretic part described by the Bouc-Wen model. 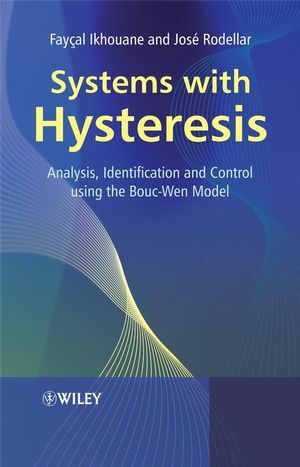 Systems with Hysterisis: Analysis, Identification and Control using the Bouc-Wen Model offers an invaluable source of ideas, concepts and insights for engineers, researchers, lecturers and senior/ postgraduate students involved in the research, design and development of smart structures and related areas within civil and mechanical engineering. It will also be of interest to readers involved in the wider disciplines of electrical & control engineering, applied mathematics, applied physics and material science. Fayçal Ikhouane, Universitat Politècnica de Catalunya, Departament de Matemàtica Aplicada III, Escola Universitària d’Enginyeria Tècnica Industrial de Barcelona. C/ Comte d’Urgell, 187, 08036, Barcelona, Spain. Fayçal Ikhouane currently holds both a research and teaching post with the Control, Dynamics and Applications group at the Technical University of Catalunya, Spain. He has been in this job since 2002, after having been a visiting scholar at the University of California in Santa Barbara, and a lecturer and associate researcher with the Ecole Nationale d’Industrie Minérale and the Ecole Mohammadia d’Ingénieurs in Morocco. He also worked in industry as a control engineer at the Société des Ciments d’Agadir, Morocco. Dr Ikhouane is now conducting research on modelling, identification and control of mechanical systems and smart structures with nonlinearities such as hysteresis and friction, and is helping to set up a new research laboratory on these topics. He has co-authored around 10 journal papers and 20 papers and presentations at major conferences. José Rodellar, Universitat Politècnica de Catalunya, Departament de Matemàtica Aplicada III, Escola Tècnica Superior d’Enginyers de Camins, Canalsi Ports, Campus Nord UPC, C2, 08034, Barcelona, Spain. José Rodellar is currently a Professor in the School of Civil Engineering at the Technical University of Catalunya, Spain. He has been at the university since 1976, and is now Director of the Control, Dynamics and Applications group, which carries out theoretical and applied research on modelling and control, with applications in structural control and smart structures. Previous to this, he has been visiting professor at the Department of Civil Engineering, at the State University of New York, Buffalo (USA), and visiting scholar at the Department of Mechanical Engineering, University of California, Berkeley. He is a member of the Board of Directors of the International Association for Structural Control and Monitoring, has co-authored and edited five books, including Adaptive Predictive Control: From the Concepts to Plant Optimization (Prentice Hall, 1995), Smart Structures and NATO Workshop (Kluwer, 1998), and co-authored around 160 journal and conference papers. 5.4 Identi¯cation methodology for the viscous + Dahl model . .